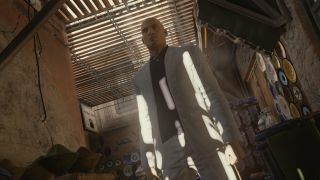 Agent 47 began his episodic, globetrotting assassination spree in Paris when his new game launched, took a detour to the fictional villa of Sapienza in April, and is now ready to return to the real world later this month. Hitman: Episode 3 travels to Marrakesh on May 31. As lovely as it is dangerous, Marrakesh is a city on the brink. Civil unrest outside of a Swedish consulate with heavy military presence suggests a populace ready to fight. Yet elsewhere, bustling markets with a plethora of stalls, shops, wares, and knick-knacks make Marrakesh feel like a postcard for tourism. Marrakesh can be purchased standalone for $10, or as part of a $50 Upgrade Pack if you already own the Intro Pack. If you've yet to purchase any episodes of the newest Hitman, you can purchase the Full Experience Pack, which includes every location as it's released, for $60. Just don't get too comfortable. Once you're done stalking your prey in Marrakesh, developer IO Interactive plans to send you to Thailand, the United States, and finally Japan when the season comes to its conclusion.